When you choose a motorcycle jacket, helmet, and other personal gear, fit is a major part of protecting both your comfort and your safety. 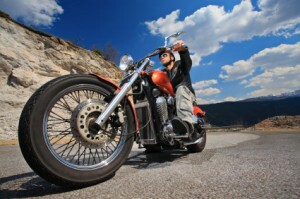 The same considerations should come into play when picking your bike, according to Motorcycle.com. For maximum comfort and safety on your bike, choose one that fits you. It can be dealt with in multiple ways. First, a bike should physically fit your body size. When you sit on your motorcycle, your toes should touch the ground without effort, and your shoulders should be relaxed with your hands on the grips – no straining or leaning forward to drive the bike. Switches and levers should be positioned so your fingers can reach them easily without forcing you to let go of either of the grips, which reduces your steering control. Fit also changes depending on what kind of motorcycle you choose. For instance, your body position will be slightly different on a touring bike than it is on a sport bike, and where the foot pegs, seat, and grips are in relation to your body will differ accordingly. Regardless of which bike you choose, however, you should not have to strain or compromise to reach all the parts of the bike you need in order to ride safely. At Tenn And Tenn, P.A., our well-trained New Hampshire motorcycle accident lawyers have helped many injured bikers seek the compensation they need after a crash. We also ride, so we know what risks you face on the road. For a free, confidential consultation by phone about your New Hampshire motorcycle injury, call us today at (603) 624-3700.